This post is a definition of VSAT solution, where and why you might need a VSAT solution. In subsequent post to come, I will be discussing about how to set up a VSAT link and also how to manage a VSAT link from anywhere around the world. Even though the existence of Fiber and microwave internet solutions, have being very competitive to VSAT solution. we must not underrate a solution that works when others fails. Okay. 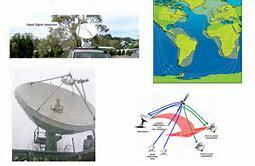 VSAT (Very Small Aperture Terminal) is a satellite communications system that serves home and business users. A VSAT end user needs a box that interfaces between the user’s computer and an outside antenna with a transceiver. The tranceiver receives or sends a signal to a satellite transponder in the sky. The satellite sends and receives signals from an earth station computer that acts as a hub for the system. Each end user is interconnected with the hub station via the satellite in a star topology. For one end user to communicate with another, each transmission has to first go to the hub station which retransmits it via the satellite to the other end user’s VSAT. VSAT handles data, voice, and video signals. VSAT solution is also known as a system that provides high speed, broadband satellite communications for Internet or private network communications. VSAT is an ideal system for mining camps, vessels at sea, satellite news gathering, emergency responders, oil & gas camps or any application that requires a broadband Internet connection at a remote location. VSAT solution is one of the most trusted ways to connect your remote locations and workers with Internet communications for email, web access, video transmissions, Voice over IP telephone services, or other IP applications for your field operations. VSAT enables you to expedite your business processes by integrating field operations with your corporate wide area network. ← NETGEAR NEW WEATHER-RESISTANT ORBI OUTDOOR ROUTER.